Breckinridge’s two brigades reach the northern edge of Kelly Field. When Adam’s men get within point blank range, Stanley’s brigade rises up and delivers a devastating volley into their faces. Casualties are enormous, and General Adams is among the wounded. However, its will be some time before Colonel Randall Gibson of the 13th & 20th Louisiana is made aware that he now commands the brigade. Adam’s advance is stopped cold. Stovall enters Kelly field to a scene of panic. Union troops are everywhere. 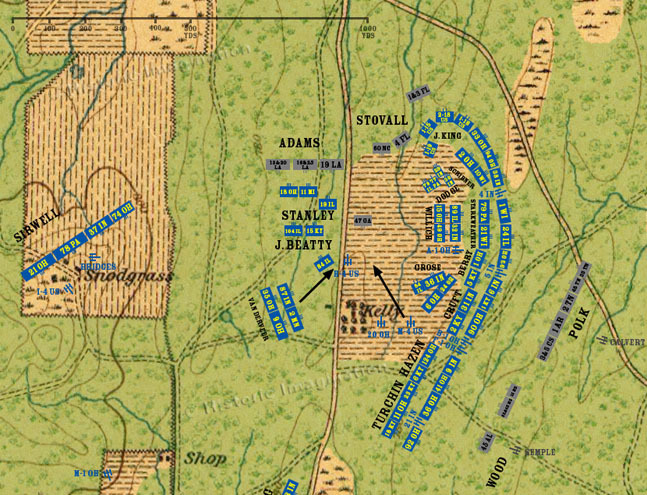 The 47th Georgia advances several hundred yards into the field, but are stopped by fire from Battery H, 4th U.S. The rest of the brigade fires into the field, or battles King’s Regular Brigade. The Regulars have refused their flank, and are fighting to maintain the Union line. Help is on the way. Battery M, 4th U.S. rushes to the aid of Battery H, and Van Derveer’s brigade approaches Kelly Field from the south. Cleburne’s Division continues its uneven contest with the main Union line, suffering severe casualties while inflicting few in return.